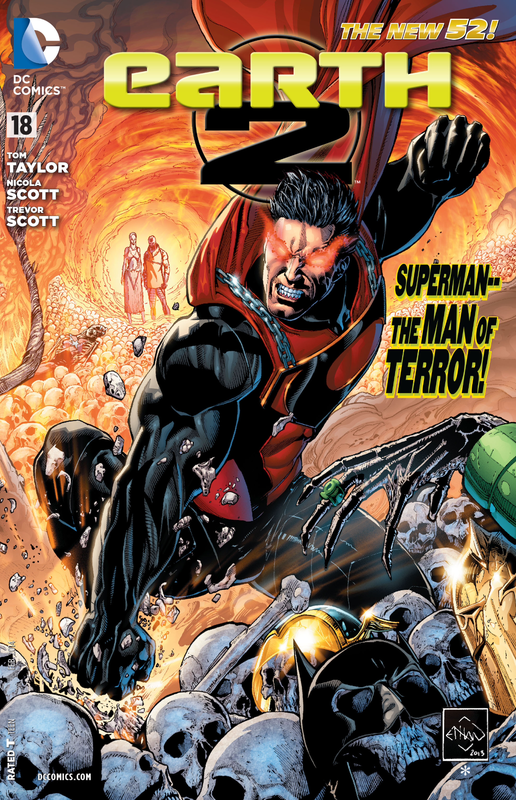 After Superman’s attack on the Arkham Command Center, the World Army and the Wonders try to pick up the pieces. In order to give them a bit more time, Jay Garrick does something absolutely awesome – he throws a rock at Superman to start up the first Earth 2 Superman-Flash race in the New 52! This one has higher stakes, of course, since Superman seems more than willing to kill while under the influence of Darkseid. Meanwhile, deep below ground, the new Batman is ready to release some VERY interesting characters to help in the fight against Superman. I’ll leave the reveal on Batman for you to read in the issue, but he isn’t the only surprise here. As for the race? Flash is clearly quicker, but….the rest is a bit spoilerish so we’ll leave it for the issue as well. 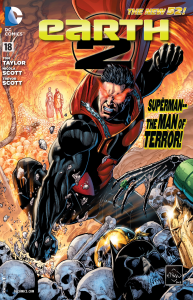 Tom Taylor is once again proving a perfect choice to continue the New 52 stories of Earth 2. His scripts are powerful – and he hasn’t missed a beat since taking over this title. Nicola and Trevor Scott continue their amazing artwork on this series, with excellent colors from Pete Pantazis – this is a consistently good title in both story and art, and it is one of my favorites. For Flash fans, we certainly weren’t left out even though the focus is clearly on Supes and Bats. And, Taylor is certainly taking advantage of the fact that Earth 2 can go in directions that the main DC Earth could never go – it makes this a highly entertaining series.